So reactionaries can make their hyperbolic claims – the TP ushers in an “inquisition” or it is only interested in “enforcing the rules”– but the fact of the matter is the vast majority of United Methodists world-wide sincerely believe the church’s sexual ethics, teachings on marriage, and its ordination standards are grounded in Scripture and 2,000 years of Christian teaching. They believe the church has openly and fairly arrived at these teachings, reaffirmed them – repeatedly – and now rightly expect its clergy and bishops to abide by and embrace them. Current and prospective clergy members are not entitled to violate UM Church standards with impunity. And a church that prizes unity, health, and vitality cannot endlessly tolerate those who would brazenly undermine its core theological and ethical convictions. The Rev. 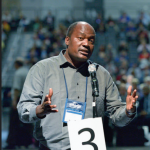 Forbes Matonga, a clergy delegate from the West Zimbabwe Annual Conference speaks at the 2016 General Conference. Photo by Paul Jeffrey, UMNS.